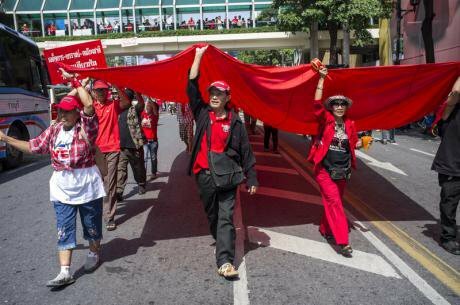 Red Shirt protesters rally at Ratchaprasong intersection. Vinai Dithajohn/Demotix. All rights reserved. As the anniversary of Thailand’s 2014 military coup came and went last May, any hopes of the military regime that ousted former Prime Minister Yingluck Shinawatra simply being a transitory, caretaker government went with it. While the leader of the coup, General Prayuth Chan-ocha, has referred to himself as a “soldier with a democratic heart” and has repeatedly claimed that he overthrew democracy for democracy’s sake, it is becoming increasingly clear that what the country’s elite is really trying to do is permanently ingrain itself within the system. Prime Minister Yingluck Shinawatra at the Federal Chancellery in Berlin. Simone Kuhlmey/Demotix. All rights reserved.Thailand is no stranger to coups. The country has continuously suffered from political instability since becoming a constitutional monarchy in 1932 (the most recent coup is, in fact, the country’s nineteenth). Successive military dictatorships ruled Thailand throughout the Cold War with hefty military and economic aid from the United States who, in a narrative that is all too familiar, saw the authoritarian generals as key allies against the communist fervor that was engulfing the wider region. In 2001, however, a subtle revolution took place as the Thai people elected the Pheu Thai party to power in the most open elections in the country’s history; a moment that has rightly been referred to as a political awakening for Thailand’s mostly poor working class population. For the first time, the bulk of Thailand’s rural poor saw their lot improve as a result of their vote. The Thaksin government gave Thai villagers access to affordable healthcare for the first time in history and brought millions of Thais out of poverty through microcredit and other redistributive schemes. 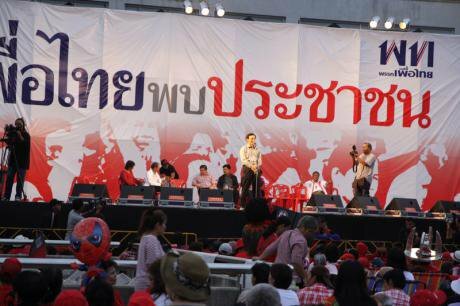 Pheu Thai party rally in Bangkok. John Vincent/Demotix. All rights reserved.It would be a mistake to imagine Thaksin’s motivations were nobler than they were. But the Prime Minister’s policies still indisputably brought democracy closer to most Thais. Previously just an empty word American soldiers used when justifying their support for Thailand’s past military dictators, democracy became something that gave poor Thais a feeling of power over the political process. The feeling didn’t last long. Thailand’s military elites soon launched a coup that pushed Thaksin into exile. This time, militant Pheu Thai supporters, mostly poor farmers, refused to bow down to the country’s elites and instead took to the streets. Called the ‘Red Shirts’ after the clothes they wore, the working class protestors repeatedly demonstrated in Bangkok from 2008 to 2010, until the army shot almost 90 protestors in April 2010. In 2011, the Pheu Thai party, led by Thaksin’s sister Yingluck, won the elections by a landslide, only to be forced out by the 2014 coup d’état. 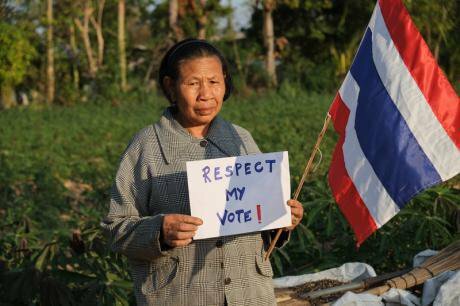 Rural villager taking part in the Respect My Vote campaign, Thailand. Matthew Richards/Demotix. All rights reserved.But what kind of political elite reacts so violently to greater equality that it ends up forcing out two democratically elected Prime Ministers? The best way to illustrate the traditional vertical structure of Thai society is through the idea of kwamphenthai, or ‘Thainess’. According to David Streckfuss, a Thailand-based academic and expert on modern Thai politics, Thainess is a euphemism that places the coup leader and the monarch at the top of the political ladder in terms of legitimacy. Anyone opposing or questioning the two automatically becomes an enemy of the state itself. 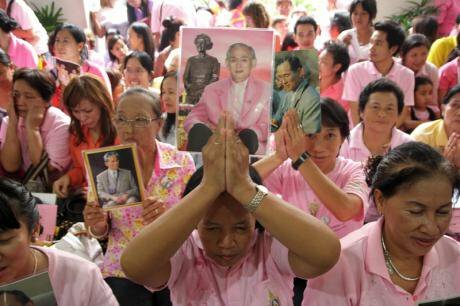 Thai people hold pictures of King Bhumibol. Piti A. Sahakorn/Demotix. All rights reserved. The Thai monarch, King Bhumibol, has ruled for nearly 69 years and is revered as a semi-divine figure by his people, so much so that Richard Lloyd Parry writes, “there is no deeper or more enduring cult of leadership outside North Korea.” When the coup leaders use the idea of Thainess to place themselves on the same rung as the monarch, they are attempting to place themselves outside and above the political system as well. Essentially, the military takes on the semi-divine attributes of the royal family. To see evidence of this, one has to look no further than Thaksin’s most recent clash with the junta where he saw his passport revoked by the Ministry of Foreign Affairs for claiming in an interview that the King’s councillors conspired with the military in planning the coup that ousted Yingluck. The police reported that such criticism of the coup and of those who carried it out could violate the country’s lese majeste law (insulting the monarch), a crime that carries a maximum penalty of 15 years in prison. Indeed, questioning Thailand’s politico-military elite is equated with questioning the monarch himself, as both are positioned above the reach of public scrutiny. 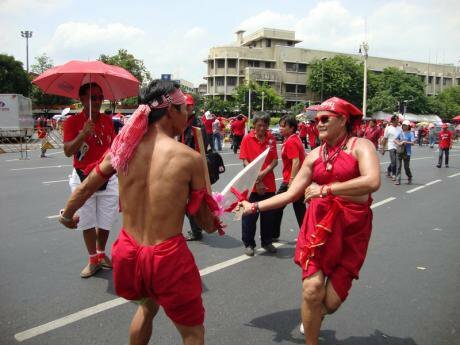 Thai protestors dancing near Democracy Monument. Geoff Costly/Demotix. All rights reserved.Nevertheless, despite attempts to reinstate Thainess as the glue holding society together, it is already clear that the Thai masses, politically awakened and engaged under Thaksin’s rule, will not willingly return to servitude. As Streckfuss observes, “this is not the same Thailand […] and neither are the Thai people the same.” And every time that free elections have taken place, the parties favouring the rural working class have come out on top – a fact that could spell the end for some of Thailand’s elites. So if elites can’t stifle the people’s desire for self-rule, what can they do? According to most analysts, they will try to retain their power by building a system that is democratic only in name. “The military is now trying to put in place an infrastructure through constitutional drafting to ensure that even when it is forced out of power, it could continue to control Thai politics,” Pavin Chachavalpongpun, a Japan-based Thailand specialist contends. Joshua Kurlantzick, an American journalist and a CFR Fellow on Southeast Asia, agrees. He writes that Prayuth and his collaborators will “strengthen[…] the power of the unelected parts of the bureaucracy,” guaranteeing that the elected government clashes with the “elite-dominated unelected bodies set up by the new constitution”. 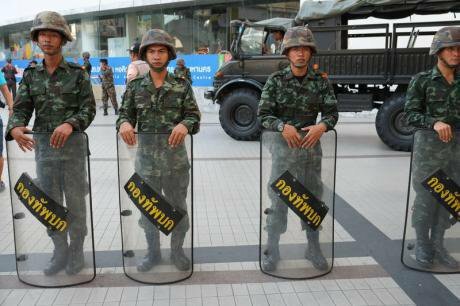 Thai soldiers stand guard near the Siam Square and MBK shopping centre in Bangkok. Matthew Richards/Demotix. All rights reservedIn other words, the elite’s re-wiring of the democratic system will make it much harder for any elected government to enact change, particularly the change that voters want. Government will merely showcase political feuds while activity grinds to a halt in the dead heat between parties. Put simply, Bangkok will start to look like Washington. It’s not immediately obvious whether there is a way to avoid this, but the most crucial act will be for the working class – and any other progressive citizens – to continually pressure the elites through nonviolent protest and to pay close attention to the new constitution Prayuth’s junta is crafting. As is so often the case in any government document, the devil is in the details.